The business operates in 3,200 square feet of a 6,200 square foot building owned by the seller. There is ample parking, lighting, and an updated security system. There is a tenant who pays the seller $2,650 gross per month in rent on a triple net lease. This listing is an established Laundromat just south of the Twin Cities 17 years ago. 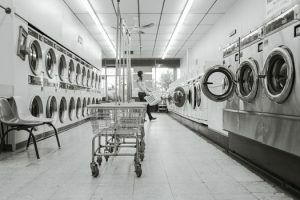 The current owner acquired the Laundromat in 2009 and has increased sales by keeping a clean, well-maintained store with updated machines and a loyal customer base. There is also a wash and fold segment of the business which can be greatly expanded within the capacity of the existing infrastructure. Dry cleaning service is outsourced and provides additional income. The seller also owns the building and has a stable tenant under contract through April of 2020. The building is for sale with the business which provides many advantages over leasing with laundromat ownership. There are 43 washers, of which 18 large are large capacity. There are 30 stack dryers and 4 newer 75# dryers. Many of the machines are less than 3 years old, and others less than 5 years old. All equipment is meticulously maintained, as is the building. A new roof was installed 7 years ago and a new boiler installed 3 years ago. This entry was posted on March 13, 2017 by Mac Thelen.